6/12 Months - $29.99 12/18 Months - $29.99 Only 2 left! 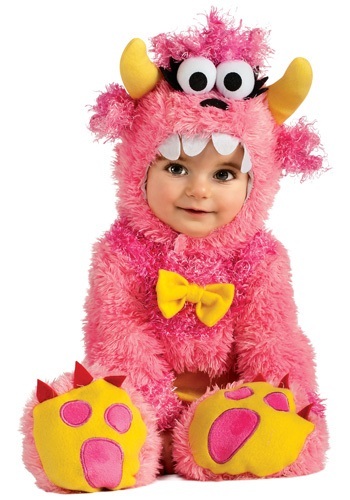 There is nothing more primally terrifying than a baby wearing a ferocious monster costume like this. Just look at those wicked horns! Those gigantic teeth! The hideous claws! We shudder to think of the brutal carnage that awaits anyone foolish enough to linger in the creature’s path. Oh wait. We were looking at a different outfit! This Infant Pinky Winky Costume is pretty much the opposite of what we were just saying. Just plug in a word that means adorable wherever we said something that means really scary or grotesque. Whoops! How embarrassing for us. Well, it may not have the cracked, scaly skin of that other costume, or the little gadget that made flashes of light and puffs of smoke erupt from the snout every few minutes, but this is a great monster outfit in its own right. It’s just more of a little pink cuddlesaurus than a humongo-destructor type. But if you planned on remaining in your current abode after your toddler’s reign of terror, that may not be a problem! Because humongo-destructors are notorious for their acid spittle, which literally burns through area rugs and carpets. Whereas cuddlesauruses are just extra-snuggly! Awww! It’s even got a little bow tie. You know, we don’t usually think that there’s a right choice when it comes to two great costumes. But when it’s down to a terrible beast who’s going to rain molten fury upon the countryside or a docile Pinky Winky, we’d suggest erring on the side of cuteness! I got this for my daughter in a 6-12 months. It's honestly just like the picture!! It is pretty thin material so keep that in mind if you're wanting something warm for your kiddo! My daughter will just wear a outfit under it for warmth! No biggie! Also, I didn't pay extra to get it shipped sooner.. it said it would arrive the 25th and I got it the 20th. It was insanely fast delivery! Definitely recommend this costume and this site in general! Great deals. This costume is perfect for a chilly Halloween night! I was looking for something that would keep my daughter warm while trick-or-treating! I also really liked the fact that it has velcro along the back and inside the legs for easy diaper changes! Our little girl looked so cute in this Pinky Winky costume. We would recommend it for people in cold climates, as it is a slightly warmer fur. The quality is great and she got so many complements.